Pocono Mountain Villas is a four seasons resort retreat in the beautiful Pocono Mountains of Pennsylvania that provides a picturesque backdrop for your vacation memories. Here you’ll find a host of on-site resort activities and amenities to enjoy every time of the year. It’s the ideal resort destination to pursue your Pennsylvania happiness. Pocono Mountain Villas is a cashless resort. Cell phone service is available depending upon your carrier. Complimentary Wi-Fi service is available to guests at Activity Central from 9:00 am – 8:00 pm and in all common areas of the resort. Wi-Fi service is available in the units through AT&T for a daily fee for each device. Spend time relaxing on your deck or in the whirlpool tub, surrounded by the beauty of the Pocono Mountains. Most units have stairs leading from the parking lot to walkways and stairs from walkways to front door. Most units are multi-level so there are stairs upstairs and downstairs. Please note: Actual room features may vary from those pictured here. This unit can be used in conjunction with a one bedroom unit as a lock-out. The one bedroom unit sleeps 4 and does not have wheelchair accessible features. *Limited Availability please call to confirm. Relax in your fully equipped one bedroom villa with kitchen, living room, and dining area with views of the golf course, lakes and woodland. Our Pocono vacation villas create a warm and cozy getaway for your family’s vacation. With dining conveniences and plenty of space, there is no other Pocono resort that provides so many amenities with so much to do while you’re on vacation throughout the seasons. Pocono Mountain Villas set the standard for that perfect family Pocono vacation with friendly service, comfortable accommodations, and a long list of amenities and area attractions. Room furnishings and layout may vary. Rates are per night and subject to applicable taxes. Accommodations for persons with disabilities. Spacious two bedroom villas in wooded settings with plenty of room for family and friends. Please note: Actual room features may vary from those pictured here. *Limited Availability, please call to confirm. The Pocono Hills Golf Course is a short, tight mountain course designed by architect Nicolas Psiahas in the heart of the Pocono Mountains. The 18-hole par-71 golf course is recognized for its challenging greens and rolling fairways. Use the Pocono Hills Golf Course online Tee Time booking engine or call 800-335-1113 to reserve a tee time starting at 8 am each morning, book a Villas stay and golf package or for information. Spend the day up in the trees while you climb, balance and zip through the 75 elements of the Pocono TreeVentures ropes course. Great for all levels of outdoor enthusiasts from beginner to expert, the family outdoor aerial forest adventure offers five courses of varying levels of difficulty. 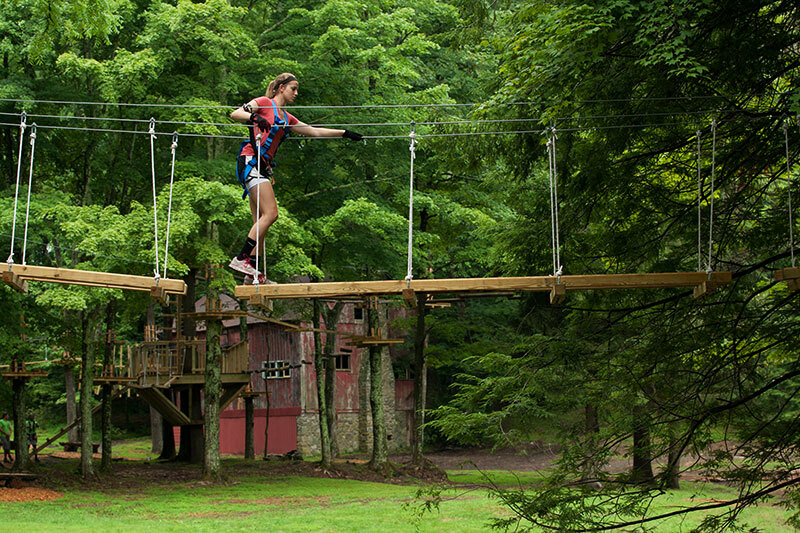 Pocono Zip Racer, 1,000 ft dual racing zip lines, Pocono KidVentures, for ages 4-7, TruClimb, tree climbing walls and Pocono Zip Quest, 9 zip lines connected by bridges and ladders is also part of the park. Each course consists of elements between tree platforms that are constructed of rope, cable and wood configurations that challenge you with aerial tightropes, swinging log steps, Tru Blues and rope ladders. Dual 1,000 ft Racing Zip Lines Come zip through the trees! TreeVentures Ropes Course and Zip Racer are open year-round weather permitting. Call for our current course conditions 800-446-0231. Two 1,000 ft dual racing zip lines let you soar through the trees at over 30 mph. Located on Route 209 in Bushkill, PA adjacent to Pocono TreeVentures Aerial Ropes Course, Pocono Zip Racer will give you the thrill of a lifetime. Plan a getaway to the Pocono Mountains and stay in the nearby Tree Tops Villas with a special stay, climb and zip packages. Spend the day in the park then and then give Blue Lightning all season tubing a try. Call 800-446-0231. Experience the thrill and fun of snowtubing in the Poconos at The Pocono Mountain Villas when you slide down the hill in snowtubes. Our 100% snowmaking makes it possible to be open from late December through mid March. Stay at The Pocono Mountain Villas and enjoy winter’s fastest growing family fun sport that requires no expensive equipment or lessons. Take a winter fun getaway as a couple or with the whole family to enjoy the Poconos in their winter splendor. When the temperatures drop, the excitement grows at the Winter Fun Center. Don’t worry about the snow not falling, when winter comes we make our own. Snowtubing in the Poconos is available late December through March. Experience the thrill of snowtubing year-round at The Pocono Mountain Villas. 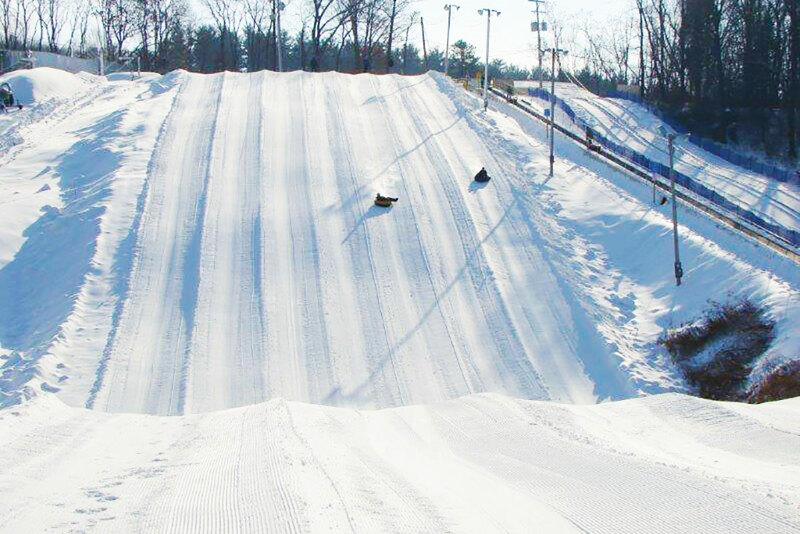 The only all season tubing facility in the Pocono Mountains, built on the slope that in the winter becomes The Pocono Mountain Villas’s White Lightning Snowtubing park. The attraction includes a Magic Carpet lift with two 400 foot tubing lanes. Ride to the top of the tubing hill on a moving carpet while holding a tube. At the top, walk off and start tubing by sitting down on the tube and gliding down on the special Neveplast runs that allow tubing without snow or water. It is the same thrill as winter tubing without the snow but with all the fun. The park is located close to horseback riding, canoeing on the Delaware River, bumper boats, Pocono Zip Racer and Pocono TreeVentures aerial ropes adventure park. Ticket sales stop two hours before park closure. For Blue Lightning Tubing information call 800-335-1113. Plan to spend the day at The Pocono Mountain Villas to fit it all in. Take a trail ride back in time through the scenic Pocono Mountains. Open year-round, what better way to enjoy the mountain views then on the back of a horse. Canoes, six person rafts, and single or double kayaks available. Open Spring through Fall. Play a round of PA miniature golf. Test your putting skills against each other to find out who can really place the ball in the cup. The Villas offers year-round swimming either indoors or out in one of its six pools. No matter the weather, it is fun to swim and splash in the Pocono Mountains. Bump into family and friends as you laugh out loud playing on the lake. 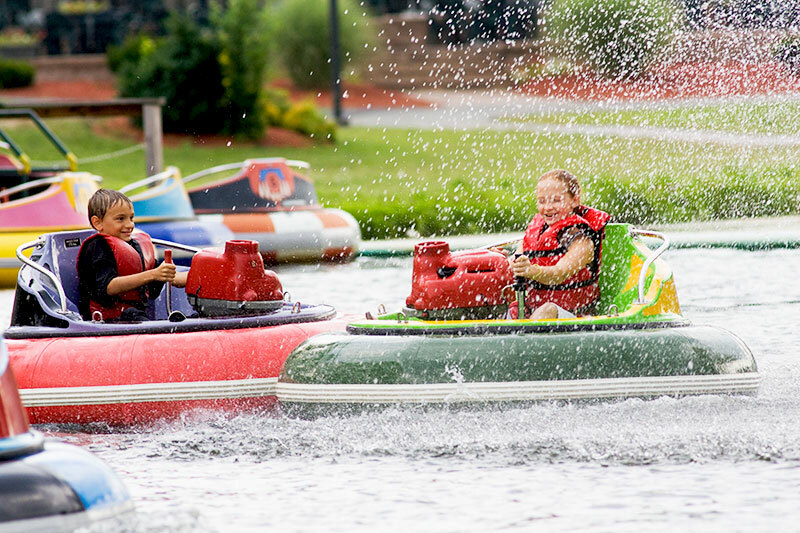 Bumper boats are also a fun way to cool off on a hot summer day here in the Poconos. The Valley Station Arcade offers optical entertainment, pool tables and an indoor and outdoor pool. It is a great place for indoor and outdoor play during your Pocono getaway. The Pocono Mountain region is known for its variety of year round attractions and things to do. From candy making to seeing wolves in their natural habitat, there is always something of interest that is happening throughout the seasons. Hike on the trails, canoe or fish on the Delaware River, hunt, attend a class at the Pocono Environmental Education Center, horseback ride, see Indian artifacts, watch the eagles soar and see the natural habitat of Pocono Mountains woodland animals. The 70,000 acre Delaware Water Gap National Recreation area is located adjacent to The Villas. Hike on the trails, canoe or fish on the Delaware River, hunt, attend a class at the Pocono Environmental Education Center, horseback ride, see Indian artifacts, watch the eagles soar and see the natural habitat of Pocono Mountains woodland animals. Edge of the Woods Outfitters offers daily, self-guided bike tours for all ability levels of guests. Or join Edge of the Woods Outfitters for an easy hike on the famous Appalachian Trail in Delaware Water Gap. Click on the button below to see current Tours and excursions in the Pocono Mountain Region. No trip to the Poconos would be complete without a day or two of shopping. From gift shops to outlet malls and boutiques, the Pocono area offers a wide variety of shopping experiences. 100 designer outlet shops in the Poconos. Shopping has never been more fun. Shopping in quaint downtown Stroudsburg has galleries, clothing shops, sporting goods stores and music shops. East Stroudsburg shopping offers restaurants, an old fashioned hardware store, and more. Hictorically rich downtown Milford has something for everyone. Called “one of the prettiest county seats in America” you will be sure to find shopping, food & fun. Open year round, just minutes from Pocono Moountain Villas, the Pocono Bazaar Flea Market puts a whole new spin on shopping. Shopping at Stroud Commons provides Old Navy, Panera Bread and a PetSmart for the other members of the family.